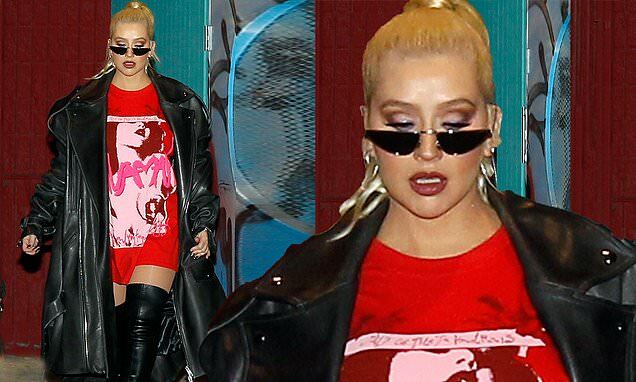 Christina Aguilera and her team celebrated the announcement of her new Las Vegas residency with a fast food treat at In-N-Out Burger on Tuesday night in Los Angeles. Earlier in the day, the 38-year-old stopped by The Ellen DeGeneres show to reveal her new residency in Sin City, debuting in May. Later she told E! News that a collaboration with Lady Gaga or Britney Spears is 'inevitable' in Vegas. Spotted outside of the popular burger chain, the blonde bombshell was wearing a thigh high pair of leather platform boots and an oversized red graphic T-shirt. On top, the Beautiful hitmaker donned an enormous black leather moto-trench coat that was several sizes too big for her five foot two frame. Ginormous jackets are the Grammy winner's signature style as of late. Christina had her blonde locks slicked back into a sleek high ponytail and bold makeup under a slim pair of mod sunglasses that she perched on the bridge of her nose. A helpful assistant was sent in the fast food join to procure burgers and fries for the star and her team. On Ellen that day, Christina shared that she as the newest pop star to stake her claim on Sin City with a residency at Planet Hollywood. Christina Aguilera: The Xperience is slated to open at Zappos Theater at Planet Hollywood Resort & Casino at the end of May. 'The Xperience is going to be my most ambitious show yet,' Aguilera said in a press release.